Our digital marketing and SEO campaign for Bloom Magic was picked up by publication The Express. 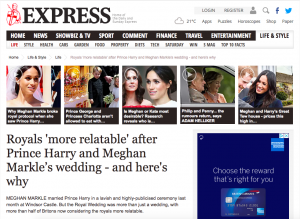 In our two part campaign, the first piece focused on how relatable the royal family were perceived to be after the televised marriage of Prince Harry and Meghan Markle. Interestingly, the research found that 57% of Brits felt the ceremony made the royal family much more relatable.